Ojai, CA. – The No. 5 seeded University of Utah men’s tennis team (15-8, 3-5 Pac-12) advanced to the second round of the Pac-12 Conference Championships after sweeping No. 8 seeded Arizona, 4-0. The Utes will face 4th seeded California tomorrow, April 24 at 11 a.m. PT in the quarterfinal round. The Utes cruised to clinch the doubles point. The tandems of Hamza/Willems and Tasevac/Lane outplayed their opponents at the No.1 and No. 2 doubles positions respectively, earning the Utes the much desired doubles point. Senior Ben Tasevac kept the momentum in Utah’s favor at the No. 2 spot. After breezing to a 6-0, 3-0 lead, Arizona’s Naoki Takeda retired. Matt Cowley downed Robin Chou of Arizona 6-1, 6-2 to give the Utes a 3-0 lead. Slim Hamza then clinched the match for Utah after defeating Kieran Thompson at No. 1 singles, 6-4, 6-1. The remaining matches were suspended because the match was decided. Utah, ranked 57th in the latest ITA rankings, and the 18th ranked California Golden Bears will face each other for the second time this year. 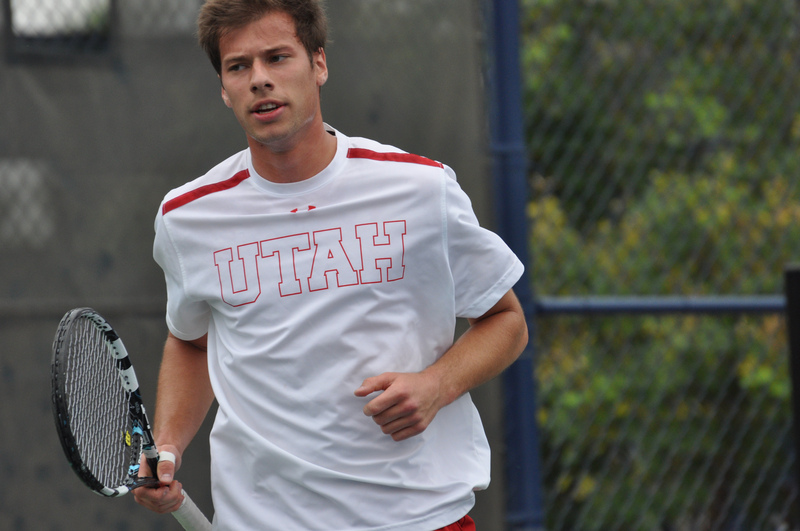 The Utes fell to California in Salt Lake City last month, 4-2, after leading for the majority of the match. Live scoring and more information on the Pac-12 Conference Championships can be accessed here. 2. Ben Tasevac (UTAH) vs. Naoki Takeda (ARIZ) 6-0, 3-0 ret. This entry was posted in Schedule/Results and tagged Alejandro Medinilla, Arizona, Ben Tasevac, California, Cedric Willems, Devin Lane, FD Robbins, Matt Cowley, Ojai, Pac-12 Championships, Roeland Brateanu, Slim Hamza. Bookmark the permalink.